Currently of course anyone who is not familiar with the quality of Apple laptops. The thin laptop is powered by Mac OS Apple OS. One of the series from Apple is the Macbook Pro MF839 Retina and also MF840 and MF841 Retina Display which is the latest series from Apple. Of course with this latest series, there are also the latest specifications and designs are much more interesting when compared to the old series. For specifications, Apple series Macbook Pro MF839 Retina and MF840 as well as MF841 is using a procie from Intel in the form of Intel Core i5 processor 2.7 GHz Dual Core which is equipped with Turbo Boost up to 3.1GHz and also 3 MB shared L3 cache. While there is already 8 GB of RAM memory with 1866 MHz PDDR3. This retina Macbook Pro consists of 3 series. And that distinguishes from these three series is only storage memory in the form of PCIe-based flash storage of 128 GB in MF839 series and 256 GB in the MF840 series and 512GB in the MF841 series. While the monitor with 13.3-inch screen has a screen resolution with a capacity of 2560 x 1600 pixels that can pamper the consumers with a sharp detail texture of the Intel Iris 6100 graphics card. 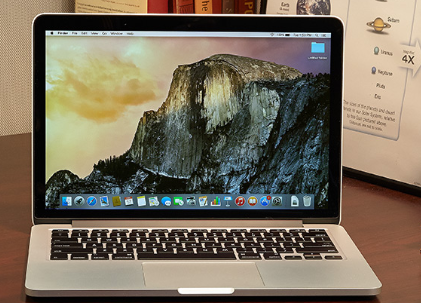 Battery of the Macbook Pro MF839 Retina series can hold for 10 hours of non-stop use .